Aluminum anodes would be suitable for any waters. Have fun shopping and welcome to AAB! I think I have it narrowed down between a 28 duckworth, weldcraft, rocksalt and a few others. 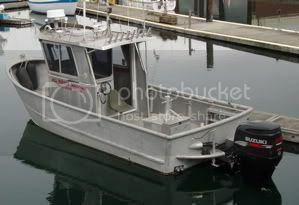 "I am considering a 1995 Ford Econ-o-van- or a 1998 chevy double-cab, Silvarado or a hand made, one-off, Ferrari.... or a few others"
(IMO) There's some real differences between a Rock Salt and both production builders' boats!! Sleeping 4 in a 28' doesn't leave much room for a fishing cockpit. Can be done-but sacrifices must be made. Our deck is tiny-like 8'x6' ish. We did not compromise on cabin space and the deck suffered. If we went with a head below the V berth, and let the passengers not have the option of facing forward at the dinette, we could have gained a few more feet. The dinette converts to a bunk, but you had better be friends/kids. The V berth will sleep three close friends, but is much more appropriate for 2. We have a hanging bunk that is probably the largest/longest sleeping spot on the boat, it hangs above the dinette. Have you considered going with a beam greater than 8' - 6"? I currently have a 28' x 10' aluminum boat in the design phase, there is a huge increase in useable space. Currently I sleep 4 in my 25ft trophy. It is crammed. We all sleep back to back. There is a strict "no rolling over rule". I would consider a 9'6". I am sure I would get used to trailering it. I average about 10,000 miles of towing a year. I am not looking for speed. Looking for softest ride. I appreciate all feedback. more useable space but not as good a ride due to fuller shaped forward & bow sections. My boat under design is a variable deadrise hull because ride & seakeeping are most important to me. Softest ride in windchop and many other reasonable conditions, boat length and width being similar, will be a catamaran. No question. If you want tin, Armstrong, ACI Boats, and Lee Shore come to mind. If glass is doable, then glacier bay or world cat (semi displacement vs planning hulls, respectively). Most, newer 28' or greater cats will let you run WOT IN 2-3' windchop while drinking your tea.